Tell on You is a psychological suspense novel that best fits within the Gone Girl-inspired niche genre of “grip lit.” Jeremy Barrett’s obsessive love equals that of Jay Gatsby for Daisy Buchanan, as life imitates art in his private school English class. But his angst-driven infatuation brings dire consequences as he is drawn into the machinations of his disturbed 16-year-old student Nikki Jordan, whose bad intentions rival those of her teacher. 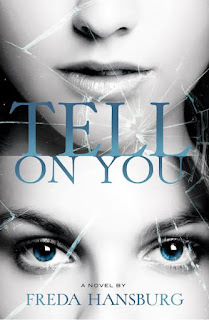 A fast-paced, drama-filled tale, Tell on You reminds readers about the wildness and trauma of adolescence—and the self-defeating behaviors to which adults resort in times of stress. From gaslighting to vicious bullying, poisonous family privilege to the loss of a parent—Freda Hansburg draws on her experience as a clinical psychologist to explore the depths of each dark situation in Tell on You. Jeremy Barrett clapped to get the attention of his second period Advanced Placement English class. When they continued talking, he barked: “Hey!” Eleven pairs of adolescent eyes turned toward him and the buzz of their conversations died down. The Forrest School demanded academic excellence along with the steep tuition. These daughters of wealthy New Jersey bedroom communities mostly rose to the challenge. Jeremy found them a pleasure to teach. He scanned the room, mentally taking attendance and ticking off today’s borderline violations of the school dress code. Here, a bit of exposed belly or cleavage, there, some serious piercing. He frowned, but not over the wardrobe issues. No one had called in absent today, but someone was missing. “Anyone know where Heather is?” They were all enmeshed in a tapestry of tweets, texts and posts. If one fell off the cyber trail for more than fifteen minutes it drew the herd’s attention. Cellphones were supposed to be turned off, but there were always a few cheaters. Probably more than a few. But nobody offered an explanation for Heather’s absence. Jeremy shrugged off his unease about the missing girl and began his lecture. The Great Gatsby, one of his favorite novels. The latest movie remake, combining 3D and JayZ, had piqued his students’ interest when he’d shown it in class. Personally, Jeremy considered the film an over-the-top, gaudy spectacle that turned Nick Carraway into a derelict and mangled Fitzgerald’s gorgeous prose and dialogue. But his students ate it up. “So, let’s come back to our discussion of how Fitzgerald used water imagery.” A loud rapping on the open classroom door interrupted. Jeremy looked over to see the principal’s administrative assistant, Mrs. Marvin, wearing a prim suit and a pinched expression. “Now?” Jeremy’s tone bore the outrage of a surgeon interrupted in mid-operation. A prickle of anxiety clenched Jeremy’s stomach as he walked down the hall to the principal’s office. Nothing to do with any childhood memories of disgrace, for Jeremy had been a diligent, rule-abiding student. His peccadilloes –well, transgressions – a recent development. He’d promised himself he’d get his act together. But – Donnelly. What did he know? The principal rose as Jeremy entered his office. A room designed to elicit tranquility rather than fear, it boasted a pastoral view of the green athletic field through French doors that led out onto a small balcony. Set on an estate, the Forrest School resembled a plantation more than an institution. Still, as Mr. Donnelly pointed him toward the sofa, Jeremy’s hands felt clammy. He mentally prepared defenses, but kept coming up short. “Thank you for coming so promptly, Jeremy.” The principal wore a gray pin-striped suit today, dressing the part of CEO. Probably to stay on a par with the parents, many of whom were CEO’s. “Of course.” Jeremy nodded. “What did you want to see me about?” He winced inwardly. An English teacher, ending a sentence with a preposition. Jeremy unfolded the paper and read the message, his mouth turning to dust. Finishing, he looked up at Mr. Donnelly in silence. Welcome to Read My First Chapter! Read My First Chapter gives readers a peek inside the most intriguing books of the year. Not only that, you can leave a comment for the author letting him or her know if you liked it or not and that you would keep reading!